The clip below is from World Class Coaching and features a progressive shooting drill. This drill and exercise is set up in a 50 yard or half field setting with both offensive and defensive players. The first player is played a ball into towards goal where they have a 1 v 1 with the goalkeeper. Once they take a shot, they immediately turn around to play defense on an attacking player going towards the same goal. Once the play is over, these two players combine to play defense together against two attacking players trying to score on goal. A separate goal is set up on the field for any defending player or players to counter attack if they win the ball against an offensive player. Players can get a lot of good experience with 1 v 1 or 2 v 2 attacking towards goal. Forwards and midfielders will benefit from this since this can happen in a game and they need to be prepared and ready. Similar to the offensive players getting practice attacking, the defending players will get a lot of reps with trying to shut down attacking players. 1 v 1 and 2 v 2 situations are very common in games, so this is a great exercise for defenders to work on and improve their skills. There is a lot of space in the grid for this drill, which creates a lot of fitness for all the players. Players not only have to sprint and run throughout this drill, they have to change directions and always be ready to move. The defensive players are allowed to counter attack if they win this ball, which is a great way to encourage good and smart defending. Players that are able to defend properly and win the ball back are rewarded by getting an opportunity to attack and possibly score on goal. World Class Coaching offers a wide variety of instructional videos. If you are interested in finding new ways to improve your teams ability to score, you might be interested in the DVD below. Just click on the link Dutch Shooting and Finishing or the image below for more information. 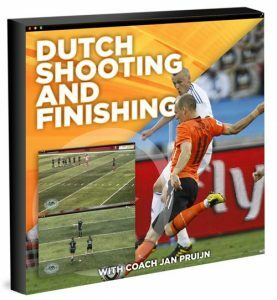 Dutch Shooting and Finishing provides you with the same drills you’d see being practiced by Manchester United, Barcelona, Ajax and other elite sides. The drills in this special video series can develop the awareness, passing technique and finishing of players at every level, whether you coach an amateur side or professional players. This is because, no matter what level you play at, shooting and finishing accurately doesn’t happen by accident. It happens from practice.